The semi-final and final of the Indian Premier League take places in Johannesburg on the 23rd May and 24th May so I'm a bit surprised that flights prices from Cape Town to Johannesburg on the 22nd May are fairly reasonable (Mango cheapest at R638). Perhaps Capetonians like watching Indian Premier League cricket in their hometowns, but aren't prepared to fly to get to the matches. This shows that these events don't have as big an impact on our transport infrastructure as is commonly believed. By the way, bear in mind that the Comrades Marathan is on the 24th May, if you're thinking of flying to Durban (this will no doubt push flight flight prices up). Amazingly, Shosholoza Meyl is offering an economy class flight from Cape Town to Johannesburg for a mere R180 and tourist class is only R340 (who's still taking the bus!). BA & SAA have exactly the same prices for their business class flights - R3232 - something tells me this isn't a coincidence. If I had to choose between them I'd go BA - however, Interlink Airline's business class price is far cheaper at R1510. An expat travels cattle class on a flight from London to Johannesburg to celebrate her Mum's 60th birthday, and they go 4x4'ing into the mountains that breathe with dragons (a.k.a. the Drakensburg). She flags the trip through the Sani Pass as being the best experience - hairpin bends on a dirt road with a sheer drop. 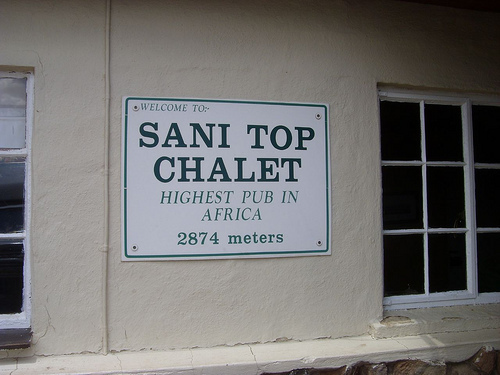 At the top of the Sani Pass, at the Sani Top Chalet, boozers (which hopefully does not include the driver) can visit the highest pub in Africa. "This is one of the oldest tricks in the book, telling passengers 'f*** you' in the politest and most pleasant of voices whilst at the same time pretending to say 'far queue'." extract from Imogen Edwards-Jones's Air Babylon book (available from Kalahari net).